Pharmaceutical firms Pfizer and Flynn Pharma have been accused by the UK's competition watchdog of charging "excessive and unfair" prices for an anti-epilepsy drug. Phenytoin sodium capsules, used by 50,000 people in Britain, are made by Pfizer and sold by Flynn. 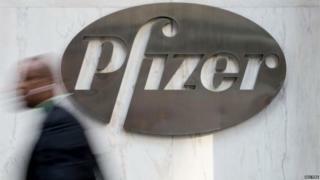 Pfizer said it was co-operating with the Competition and Markets Authority. When Pfizer made the drug under its Epanutin brand name, the NHS spent about £2.3m on the drug, the CMA said. This amount soared to £50m in 2013. The CMA said Pfizer sold UK distribution rights to Flynn in 2012, but continued to make and supply the drug to the company. This is a provisional report, with allegations made by the Competition and Markets Authority. The companies now have a chance to give formal responses and a final ruling may not be made until next year. But it comes at a time of intense debate about NHS finances, as patient demand and the cost of treatment rise faster than budget increases. NHS England is grappling with the need for ambitious efficiency savings. It has been under fire for reducing the number of treatments available to patients through the Cancer Drugs Fund. So today's provisional findings, with renewed scrutiny of drug spending, are the last thing the pharmaceutical industry needs. It was after this deal that prices rose, said the watchdog in a provisional finding. "The CMA's findings on dominance and abuse are provisional and no conclusion can be drawn at this stage that there has, in fact, been any breach of competition law. We will carefully consider any representations from Pfizer and Flynn Pharma before deciding whether the law has been infringed.," said Ann Pope, CMA senior director of anti-trust enforcement. Companies can be fined as much as 10% of annual sales for abusing a dominant position in a market, depending on the seriousness of the abuse. Pfizer and Flynn can now supply their own views and evidence before the watchdog makes a decision, it said. "Ensuring a sustainable supply of our products to UK patients is of paramount importance to Pfizer and was at the heart of our decision to divest the product," said Pfizer in a statement. "Pfizer is co-operating fully with the CMA's ongoing investigation." A message left with Flynn Pharma was not immediately returned.